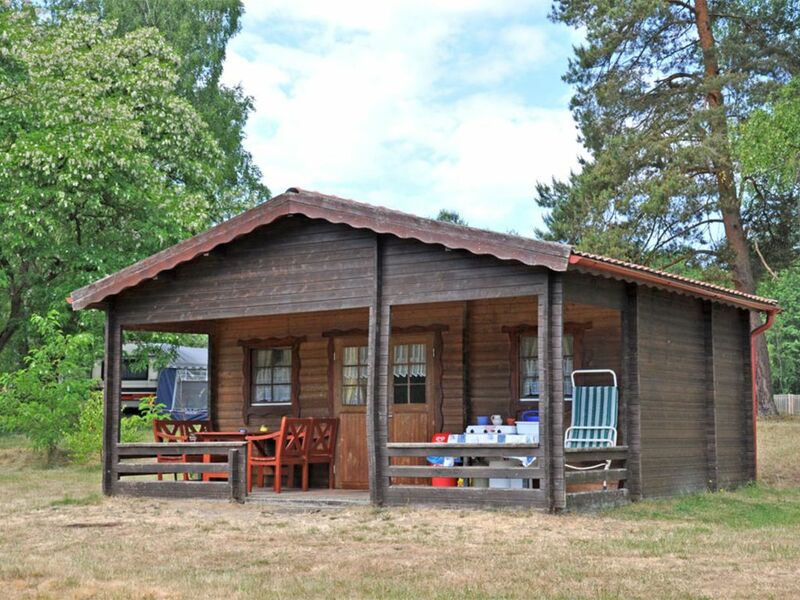 The very simply equipped cabin is located in the middle of the campsite, is about 30 square meters in size and can accommodate up to 4 people. The cabin has a wooden floorboard and has a living space with a rattan seating area, a flat-screen TV and a radio. In the living room there is also a kitchen corner with fridge and a dining area. From this living and kitchen area, a steep staircase leads to an open loft with 2 sleeping possibilities. There is also a separate bedroom with a double bed (with curtain separated from the living room). Furthermore, adjacent to the kitchen area, a separate small storage room with various small kitchen appliances can be found. The cabin has no water connection. WC / shower must be centrally located in the sanitary building of the plant. The furnished terrace has a gas cooker and a barbecue. Pets are welcome in this property. The campsite is located in the small village Fleether mill, a district of the small town Mirow (about 6 km away). The facility is about 16.5 hectares, is surrounded by a forest complex, right on Rätzsee and is thus starting point for many water walkers. In addition to an apartment and two mobile homes can be rented a cabin and several caravans for overnight. The equipment criteria can be found in the description of the respective object category. On the premises there is a bistro (open from May to September) with hot and cold dishes, a bakery and a canoe / kayak and bike rental service. A sauna can also be used for a fee. There is also a car park, modern sanitary facilities, a playground and a swimming area. It can be used in the sanitary section for a fee, the washing machines. Naturist holidaymakers are welcome. The following services are included in the total price for all accommodations: water and energy consumption. Towels and linens are not provided by the guest. Linen can alternatively be booked for 3 EUR / package. For all rentals a deposit of 100 Euros will be charged locally. The along on the trip of pets is allowed free. When renting the caravan but with limitations (only 1 small dog up to max. Rist height 40 cm). Please note: The rental of the properties for bachelor farewells is not allowed! Mirow is a tourist center in the Mecklenburg small lakes. Ideal conditions for water sports. Attractions are the castle island with the Royal Palace and the Johanniterkirche, as well as the idyllic island of love.